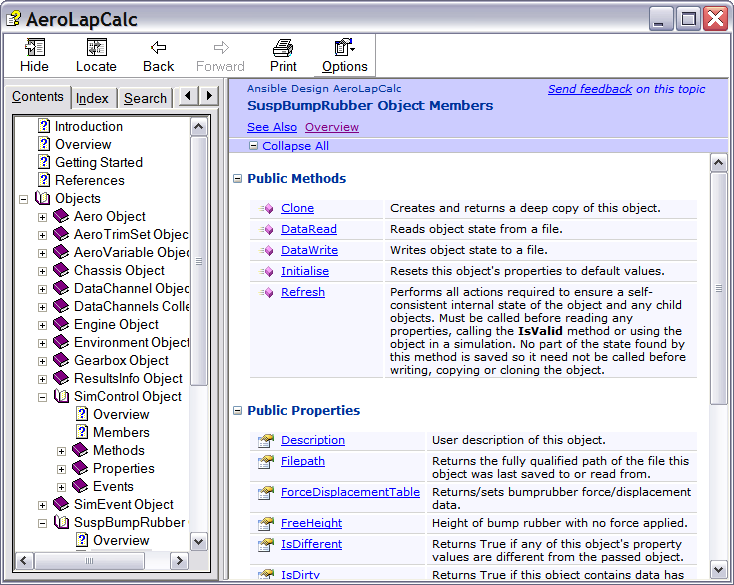 AeroLap has many features both on the simulation and modelling side, and also for data entry and analysis of results. New features are added frequently. See the history for details of the latest changes. Logical, crisp design with comprehensive context-sensitive help system allows you to be up and running with a minimal learning curve. Allow many simulations to be run in a relatively short time. Caters for road course and speedway cars with either symmetric or asymmetric set-ups. Provides simulation results as a lap time and over 200 simulated data channels - you can analyse the simulated performance like you use your data acquisition system. Complex track geometry can be automatically generated by importing acquired data. 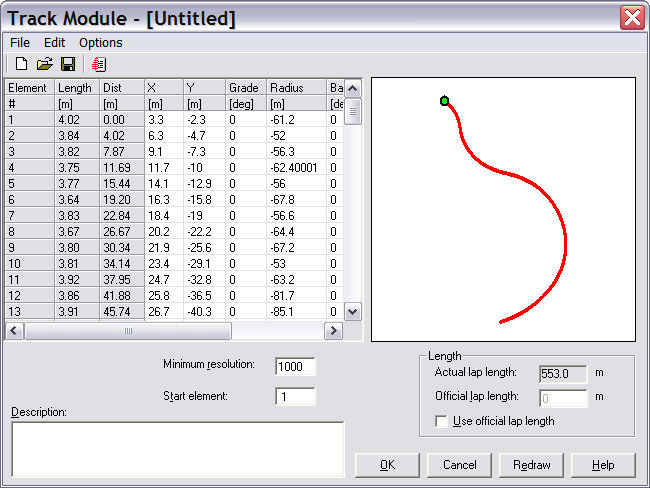 You can also design track layouts easily using any number of simple elements - for example a basic speedway can be created from just 4 straight and 4 curved elements. Bank angle and gradient can be added if required using the Track Profile tool. Data can be imported from any data acquisition systems with an text export for graphical or tabular comparison with the simulated lap - making it easy to accurately set up the simulation and compare results. Simulated lap data can be exported for analysis in third party data tools. All data files can be created and edited from within the program using purpose designed dialogs. Where appropriate the data is represented graphically with curves or contour plots drawn as you enter the data. All tabular data can be pasted to or from a spreadsheet. Where appropriate vehicle characteristics can be modelled as fully variable - e.g. aero coefficients as a function of ride height, tyre properties varying with camber or vertical load, suspension properties varying with wheel travel - but AeroLap also allows you to represent characteristics with fixed values, or with a single data point. This is essential when modelling aspects you don't have data for, and very useful when trying to isolate the effects of individual behaviours. You can choose the units for all input and output quantities from a comprehensive selection. Units are set on a per quantity basis so you can mix units from different systems. Before each simulation all input values are checked wherever possible for validity. If any value is outside a valid range you are warned with a clear dialog describing all problems found in the data. If you want to go ahead anyway you can override this. AeroLap can use non-linear aeromaps created by AeroContour which provides data visualisation and regridding tools. AeroLap can use output files from the latest version of AeroSusp to define variable suspension characteristics derived from 3D kinematic analysis. The simulation engine is provided as an ActiveX component that can be used in any environment that can host ActiveX, for example Microsoft Excel or Visual Basic. In Excel to set up parameter sweeps of, say, decreasing fuel load with decreasing tyre performance. Data can be wholly or partly sourced from the spreadsheet. For example most data could come from files saved from the standard version but gear ratios could be fed from a race engineering setup sheet. With a multi-objective parametric optimiser to automatically explore the trade-offs between different parameters. With MATLAB to drive a set of experiements. Full on-line help is provided for the object model. If you want to to automate simulation running but don't want use the ActiveX interface you can launch AeroLap from the command line with arguments. The car weight and weight distribution can be defined in a setup condition that is different to the racing condition. Changes are automatically accounted for in a static analysis performed at the start of the simulation. This allows you to try, for example, different fuel loads or to switch between setup and racing wheels without entering any new values for the suspension position. The basic car model can be driven with a set of applied conditions - speed, longitudinal and lateral acceleration - which can be swept through a range to apply aerodynamic and inertial loads to the chassis and suspension. Recently completed simulation runs are stored and can be recalled - complete with results - just by clicking an item in a list. Tracks do not have to be closed - you can define open tracks as well. This feature can be used to define a straight-line drag strip - very useful for looking at acceleration performance, terminal speeds or gear ratio choice. You could also create a single or multiple corner complex taken from a larger track and then run the simulation just on that section to get a detailed understanding of behaviour through it. The start speed on an open track can be freely defined. 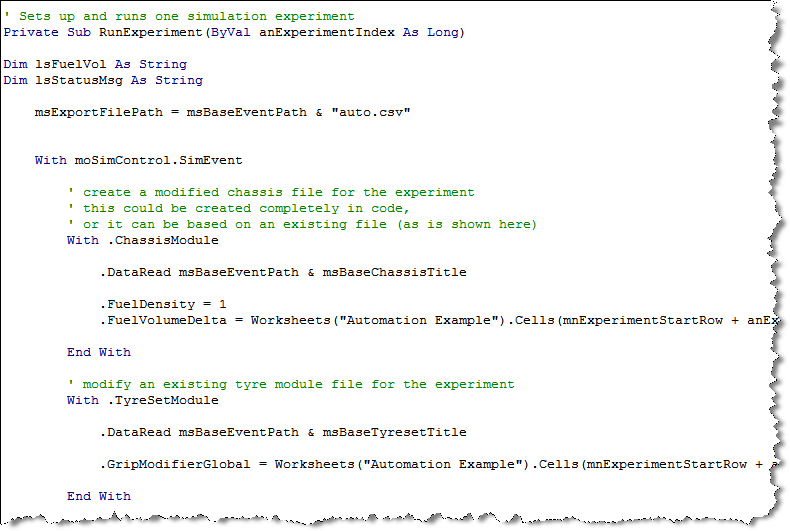 Track creation is simple using the provided editor, or pasting data in from Excel. Aero maps can be entered directly or or using AeroContour, a purpose written companion program for aero data visualisation and processing with comprehensive graphical output, available separately. 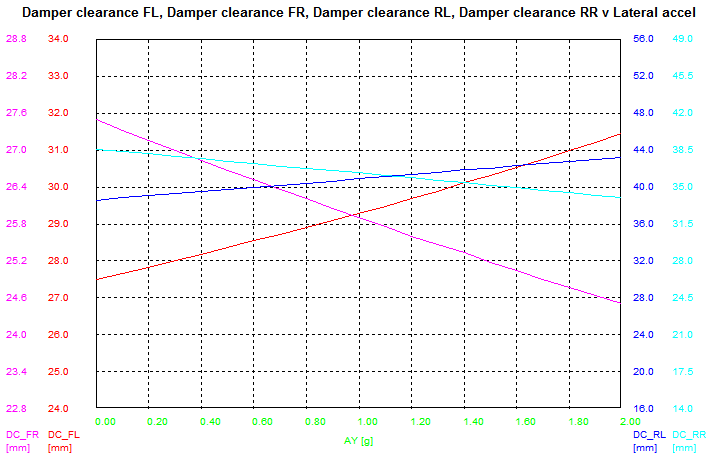 Suspension characteristics can be modelled with fixed values - e.g. one value for anti-dive angle - or with a comprehensive set of values that alter with wheel position. These values can be entered in the built-in editor or you can use AeroSusp, a companion program for AeroLap which offers full 3D suspension kinematic modelling, available separately. AeroLap can also be supplied for distribution as an OEM or customised product, exclusive to a single customer. These versions can use an encrypted data file for one or more modules, which AeroLap can use but not display. New data files can be supplied by the manufacturer directly to a team. This allows the manufacturer to maintain complete privacy for its data while still giving the team a tool to set up their car with accurate data e.g. gear ratios could be chosen with confidence before the test or race.